Unfortunately, Janae’s discrepancies on the definition of healthy relationships stemmed from the home she grew up in. Longing for the love and support she never knew, she became lost and confused. Finally, after Janae realized her family would never change, she decided to embark on a new journey. She wanted to make something of her life, but she couldn’t return to her old school because she had lost all her credits. Texans Can Academies became her second chance at life. 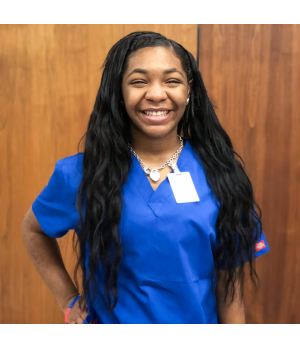 As Janae continued to progress and soar through Texans Can, Miss Michelli, the assistant principal, told her about the Certified Nursing Assistant Program offered at the school.